Two of my Lulus kind of ran the gamut: the wildly voracious Evelyn Lear and the entirely passive Ann Panagulias. Lulu is woman, a creature who fills man's imagination and becomes the sum of his desires. 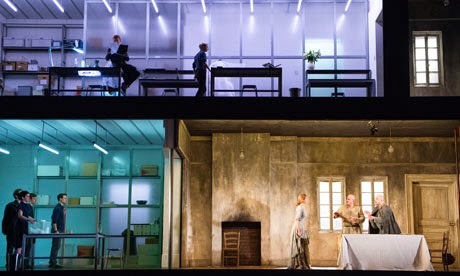 In this version of Alban Berg's Lulu from Théâtre Royal de la Monnaie in Brussels, part II of the Barbara Hannigan film festival, a specific interpretation is offered. Before the composed prologue is a spoken English language preface that relates the myth of Lilith, the first woman created by God who refused her position of subservience to man and was replaced by Eve. So when we reach the prologue at the beginning of Lulu, and Lulu is introduced last in the menagerie as the snake, we recognize that she has been assigned the position of temptress in the Garden of Eden, she who leads Adam and Eve out of paradise. At this point she is still a child, easily recognized by her long red hair. She is already in childhood a dancer and can already dance en pointe. The transition from Lilith to Lulu is very smooth. In Act I she is already married to a rich medical doctor. She begins her characterization clad only in her underwear and ballet shoes, dancing en pointe. A photographer photographs her with the animals in the menagerie. For some unknown reason there is a wheelchair and crutches. Her husband catches them together and dies of a heart attack. So now she is rich. In scene 2 she is married to the photographer, and their pictures are selling well. Lulu still wears her ballet shoes. Every so often she pulls down his pants. "It has been so long since I danced." She never seems to get tired dancing and singing on her toes. Lest we think she is miraculous in some ways, her German is mediocre. Dr. Schön and the photographer argue over her name. Mignon? Nelly? Eva? Lulu has taken off her ballet shoes. Her husband slits his throat after talking to Dr. Schön who should have kept his mouth shut. Alwa arrives, then a ballet troupe of children who stare at the dead photographer on the floor. Lulu puts her shoes back on, for Alwa has arranged for her to fulfill her greatest dream of becoming a ballerina. A dresser helps her into her ballet costume. She is dancing, all are loving it, until she sees Dr. Schön and his fiance, when she faints. There's a prince who wants to take her to Africa. I have seen all this 3 times before but have never been so engaged in the story. The story is, apparently, that Dr. Schön met Lulu when she was trying to pick his pocket. He fell for her but had a more "anstaendige Frau" that he was engaged to and kept marrying Lulu off to other men. He doesn't want his fiance to know about her. An "anstaendige Frau" does not exactly have an English equivalent. A woman is "anstaendig" or she isn't. Proper. Decent. Honorable. Your gentleman son could marry her. That sort of thing. Obviously Lulu isn't. A dancer dressed as Lulu comes out and does a soundless dying swan ballet, removing her top, and letting down her hair before falling dead on the floor. Stunning. Lulu watches from the wings. This version of Lulu is very strenuous, but you could not ask this dance, too. What an amazing thing this is. Act II begins in the same set. Lulu's hair is now silver, and she is seen taking off her ballet shoes. In the menagerie cages is someone who looks like her but with auburn hair. Countess Geschwitz is there and invites Lulu to a party. She hopes Lulu will come dressed as a man. Lulu is now married to Dr. Schön who complains constantly. She looks like the child in the prelude. He has a gun and holds it to his head. Dr. Schön changes Lulu into a red dress with gold shoes. There follows a confusing scene where people come and go declaring that they wish they had married Lulu. Alwa enters and has a long conversation with Lulu--they are brother and sister, lovers, we don't quite know what. Dr. Schön, who is Alwa's father, waves his gun around. In the middle of this scene Lulu says to Alwa apropos of nothing, "Ich habe deine Mutter vergiftet. I poisoned your mother." All are obsessed with Lulu, including Lulu herself. She makes a long Lilith-like speech and shoots him. Then she says, "The only man I ever loved" and worries that she will be thrown out of school. Countess Geschwitz watches all this. Alwa comes back in time to see the murder. The child dancer from the prelude appears, and the interlude between scene 1 and scene 2 is her plus the Lulu in the menagerie dancing. Who is Lulu? Does the fact that all are fascinated by her define who she is? He wanted her to kill him, and she did. Everything in this opera is about Lulu. Her doppelganger is seen constantly inside the menagerie mimicking her actions. Her child self dances. A screen appears and shows films of her, perhaps created by the photographer from act I.
Countess Geschwitz has had cholera and is a blonde now. She sits in the wheelchair from Act I. She has successfully executed her plan to pass herself off as Lulu and get Lulu freed from prison. Lulu limps in on the crutches, and they plan to get her out of the country. As soon as the athlete is gone, she throws off her crutches and her hospital gown and celebrates her freedom. And here for its first 40 years the opera ended. It is not an entirely unsatisfactory ending. My own intermission: I am enjoying very much watching this and writing about it. I have never been particularly attracted to Wozzeck, a story about a man forced to eat nothing but beans. Lulu is another matter. The music, always uniquely Berg-like, moves smoothly from speech to Sprechstimme, to recitative, to pointillist aria. Barbara Hannigan makes it all look easy. It is a spectacular performance from any perspective, impossibly lyrical. Lulu is merely living her life independent of the swirl of passion around her, caring about dancing, outfits and furniture, like hundreds of women you know. It is Lulu's 27th birthday and we are counting the lighting of her birthday candles. Lulu is living under an assumed name in Paris. Countess Geschwitz is there, Alwa is there, the narrator who has been with us from the beginning is there, the athlete is there, Schigolch is there, the child Lulu is there. They discuss a stock they are all invested in. Lulu herself appears to be stoned and passes out. The little girl dance troupe is in the menagerie. Lulu is a mess. The orchestration here is quite fascinating. We are in the part not orchestrated by Berg. Lulu is chopping off her hair in preparation for fleeing. The shares have collapsed. The candles of the birthday cake are still burning, and the children blow them all out. Lulu and Alwa get away. Lulu has fled to London where she has married Alwa (4th husband). She has short blonde hair and wears her dancing shoes and a tutu. She tries to dance but is bad at it. Child Lulu is still with her. I can see that one might prefer a Lulu that ends with her getting out of prison. While he was alive, Dr. Schön protected Lulu, but now that he is dead everyone else fails in this vital task. She becomes a prostitute, and as her third trick she meets a man who looks like the beloved Dr. Schön. He kills her. The child Lulu stays with her to the end. The repetitive visual elements--the child Lulu, the children's ballet troupe, both things that are not actually part of the story, and the scale covered narrator--overwhelm and obscure the actual characters. We see perhaps more vividly than before the destruction Lulu. One Lulu in 5 years is perhaps enough. Sergej Prokofjew Der feurige Engel, or The Fiery Angel with Evelyn Herlitzius. The one time I saw this in San Francisco it was amazing. Richard Wagner Die Meistersinger von Nürnberg starring Jonas Kaufmann. Need I say more? Jaques Fromental Halévy La Juive with Kristine Opolais and Roberto Alagna. Giuseppe Verdi Un ballo in maschera with Piotr Beczala, Simon Keenlyside and Anja Harteros. Interesting things lie in the future. 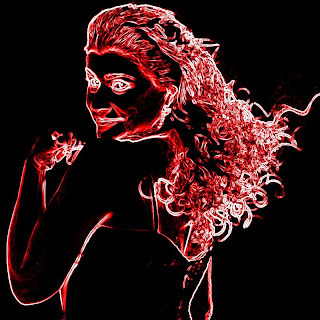 Cecilia Bartoli's Salzburg Norma will play in Salzburg this summer and again in Zurich next season. She is also doing Le Comte Ory next season in Zurich. Salzburg Festival this summer will also have CB doing Iphigenie en Tauride and Sophie Koch as the Rosenkavalier. Anja Harteros will sing Arabella at the Munich opera festival this summer. And Netrebko, and Damrau, and Kwiecen, and Pape, and.... So much. 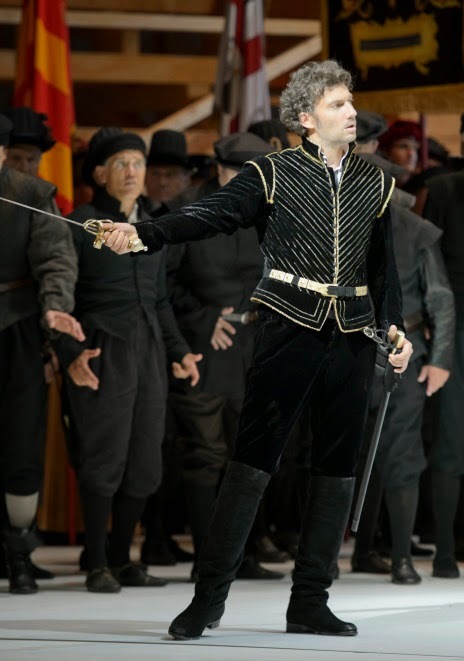 Jonas Kaufmann will sing Walther in Die Meistersinger in Munich next season. I'm hoping it will stream. Next season Roberto Alagna will sing in La Juive in Munich, too. Maybe I should move to Munich. Or please be sure to stream everything I like. Janis Martin, a Sacramento native and El Camino High School graduate who became an international opera star, died Dec. 14 in San Antonio at age 75. Ms. Martin grew up in a musical family. Her father, Emil Martin, a longtime program director for McClatchy Broadcasting, got his start before World War II with KFBK radio as a studio organist and musical director in the days of studio orchestras, said her brother Richard Martin. Her mother, Helen Martin, was a singer. 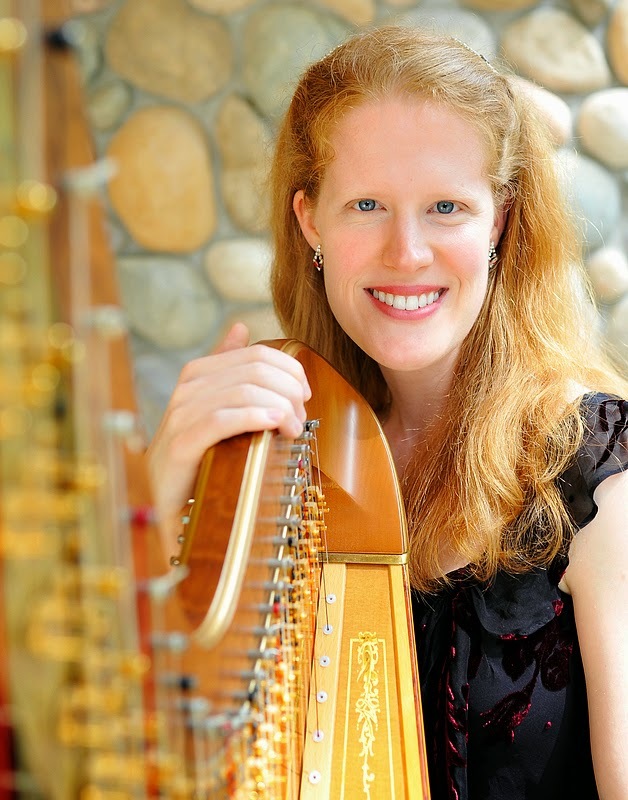 Ms. Martin studied at California State University, Sacramento, and UC Berkeley, but she was more interested in singing than academics, her brother said. When she was 18, she entered the Merola Training Program at the San Francisco Opera. Two years later, she won the Metropolitan Opera auditions in New York, placing first among 1,500 singers. The first prize consisted of $2,000 and a three-year contract at the Met. At the end of those three years, she went to Germany, which became her home base for most of the next 40 years. 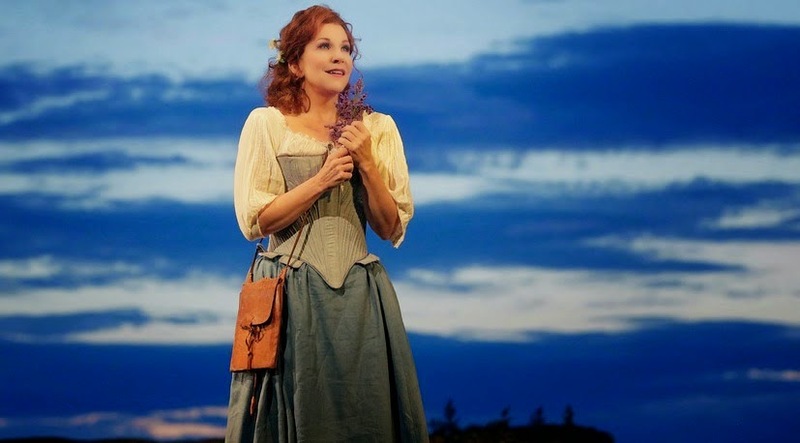 She began her career as a mezzo soprano, but transitioned to a soprano. She devoted much of her career to performing in Richard Wagner operas, in roles that included Senta, Sieglinde, Kundry, Isolde and Brünnhilde. Ms. Martin performed at all the major opera houses. She enjoyed long associations with the Deutsche Oper Berlin and the Bayreuth Festival, and also performed at La Scala, Vienna State Opera, the Royal Opera House, Covent Garden, Paris Opera and Staatsoper Hannover. Ms. Martin was twice married and divorced. He second husband, Gerhard Hellwig, was the artistic director to Wieland Wagner in Bayreuth, and the director of a boys choir. Their son Robert Martin recalls singing in his father’s choir and performing with his mother on stage as a child. His mother often appeared in “Hansel and Gretel” sometimes in the role of the mother, and other times as the witch. She retired later that year and spent the last seven years of her life in San Antonio, where her son lives, enjoying the role of “Omi,” or grandmother, to her two grandchildren, ages 5 and 8. “She had a full life and a massively successful career,” said her son, adding that she seemed content in retirement. Her cousin Chris David of Fair Oaks recalled that Ms. Martin last visited Sacramento in September. She spent time with relatives, including her 97-year-old aunt, David’s mother, Phyllis Boyles. David said she was playing a CD of her favorite band, Tom Rigney and Flambeau, in the car and Ms. Martin asked the name of the group. “She said she really liked them and she encouraged me to tell them she did,” David said. Richard Martin said he will remember his sister as an ebullient woman with a wonderful sense of humor. Robert Martin said his mother died of natural causes, but her death was unexpected. She was in reasonably good health and leading an active life. Ms. Martin is survived by her son, brother and two grandchildren. At her request, her son said, no formal services are planned. Anna Netrebko is being picketed in Zurich where she is singing Anna Bolena. Playing her husband is Luca Pisaroni who is looking very gangster. The reviews are good. Richard Strauss: Four Last Songs, who did the best recording? I would say Gundula Janowitz. I responded with Jessye Norman. Mark S. I find Janowitz hard to beat, but much of that is due to Karajan's nuanced handling of the orchestra. Della Casa sings it as well as anyone. Jessye Norman is fine if you enjoy under-pitch singing. Barbara B. Singers are not generally trying to achieve orchestral intonation. Pitch nuances are part of the phrasing. Orchestral objective is to keep you from sticking out from the other players. Solo singer objective is to make yourself stick out. Choral singers need to sing in very precise tuning but not soloists, particularly not opera singers. Mark C. Great observation, Barbara. As a conductor, I know that many of those moments which produce 'chills' are, in fact, caused by singers vocalizing a few cents below pitch. This has also been proven experimentally. It tends to work on flat sevenths. This kind of arguing is fun, but pointless. Here is an interesting article about racism in opera. It's from last summer. It is important to realize that events in the past cannot be shoehorned into the 21st century. People in the past did not think as we do. Opera is an art form from the past. If we removed every distasteful thing we didn't like, it's difficult to see what would be left. We love it anyway. Aida is sometimes played by a white woman. She was probably chosen because her voice suited the role. I recently read a tirade by a young woman who bought her tickets thinking a black woman would sing, and instead it was a white woman. She became furious. The originally cast singer was ill. As I have pointed out elsewhere, there is no reason to suppose that the Egyptians in the story were not themselves also black. The story is about national identity and not race. Think Romans and Gauls, as in Norma. Or French and Germans. Otello is usually played by a white man because we are lucky to be able to find anyone at all who can sing Otello. If you know a black man who qualifies, will you please suggest him. The story is about race, so Otello is done in black-face, a phenomenon that has cultural significance only in the United States. I read in one of the comments that the owners of Porgy and Bess are the ones who insist that it be sung only by black singers. I will stop blaming Gockley. At the beginning opera was written on subjects based in Greek mythology. Are they then parodies of Greek culture that patriotic Greeks should complain loudly about? Every theatrical work is a parody of one kind or another. The only issue is does this parody still speak to us? I object to Butterfly and refuse to go to it because of the objectionable portrayal of the white man in the story. He is simply profoundly disgusting, a racial parody of the worst possible sort. By contrast Cio Cio San is complex and fascinating. This is just my personal opinion, but I think insisting that characters can only be played by members of the represented race is itself racist. I prefer that singers are chosen for their singing and acting. Eric Owens is singing all around these days, recently in Flying Dutchman. He was recently announced for Philip II in Don Carlo. He is a great singer and should sing everything he can. At home I am not allowed to discuss this subject. I did not come from music. I sang in church. I loved Judy Garland and Barbra Streisand, and not opera singers. Later I loved the black American opera singers: Leontyne Price, Kathleen Battle and Jessye Norman. I came by accident to Jussi Bjoerling but loved him still. And Elisabeth Schwarzkopf, of course. So I suppose it should surprise no one that the loves of my present life are Cecilia Bartoli and Jonas Kaufmann. I fell suddenly madly in love with Cecilia because there is simply no one like her. I can think of no one who presents song after song, aria after aria, where each note fascinates, each piece shines with a special glow. I think perhaps only my black Americans, who carried their native born styles with them into classical music, have achieved this. Cecilia was born into her repertoire. It has been said of her in something I read recently that she could sell the phone book. I don't believe this. She knows her repertoire more deeply than others. Here in America our singers are trained to hit the correct notes and rhythms and to pronounce the words right, but of the music there is nothing. The music is in the spaces, the small variations in the rhythm, the subtle changes in the volume, the movement on and off the note, the subtleties that you perhaps must know from childhood to present the music effectively. Our singers are taught classical music as though it were a foreign language, which perhaps it is. It is not a coincidence that Cecilia sings mostly in Italian. She is an educated singer of great knowledge, but she sings each piece as though she were born to it. And perhaps she is. Currently I cannot let go of her Norma, it seems. I can go to performances that present it in the generally accepted way, and feel that I am seeing an entirely different opera. When I hear her performances of Italian recitative, I find it a pity that so often the great composers did not compose the recitative themselves. It rises in her voice. It achieves the dramatic intensity it was meant from the beginning to carry. 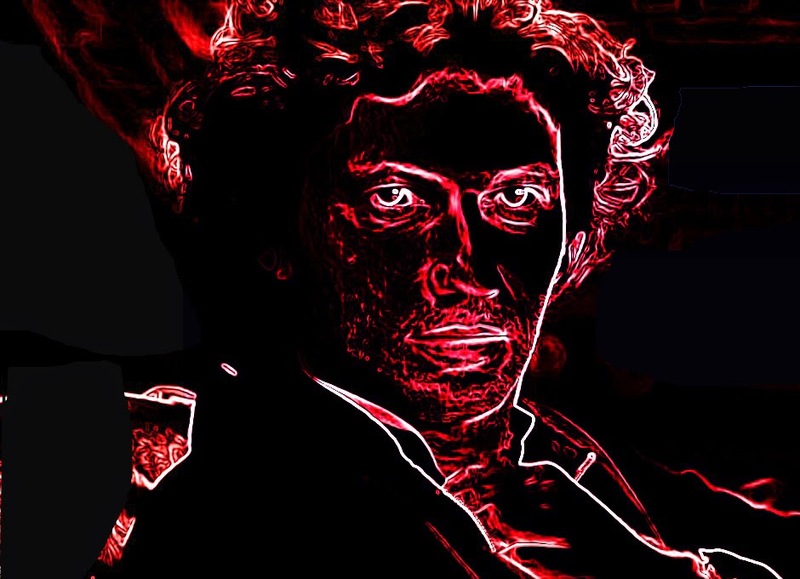 So now I have Jonas Kaufmann to love also. I worked into him slowly. I saw his Florestan accidentally in Zurich, and loved it. "A Florestan to die for," I said. Then I fortuitously bought his Strauss Lieder and found them charming. Here I am entirely at home. He is also singing the music of his German soul. I love Lieder perhaps best of all, and feel my own heart opening to this intellectual man in a way that startles me. Music is from the soul. He is astounding to me because he finds the music in such a wide variety of places and styles. People complain about him and want him to sound like Fritz Wunderlich, as though singers were in some way obligated to imitate one another. What they are required to do is to find the music in the pieces they are performing. Modern young singers are constantly coaching with various people, people who I am sure reign them back from what ever corner they have wandered into. I'm telling you to go too far. Someone is sure to reign you back in. Look to Russians for their repertoire, see Italy in the Italians, find the French. Try as hard as you can to hear the differences between all these styles. A large part of the work is to find the music. Looking for stylistic differences between eras and genres is a good place to start. I love it that the French fans find Jonas their favorite foreigner in French repertoire. I love it that he is both correct in all of these styles and deeply emotional. Perhaps the Europeans are more at home in their own music. I am in Ohio, and we went together to a local movie theater to see Rossini's La Donna del Lago live from the Metropolitan Opera in New York. The production is from the Santa Fe Opera, and I found it very pleasing that the sets in the first half reminded me so much of Santa Fe. In Santa Fe you would be watching God's sunset at the back of the theater instead of this projected one. Set changes slide quickly and easily out from the side, and the expected size of the stage is quite small. Elena is a beautiful young woman who lives a simple life in the country. She rows on the lake and lives in a small cottage nearby. At the beginning a handsome young man sees her and rejoices at his good fortune. He had heard of her before this, apparently, and this is his first sighting in real life. So Elena is known far and wide to be very beautiful and still single. Elena likes him and invites him to go home with her. Elena has a rather complex life. She already has a boyfriend, Malcolm, when this new admirer shows up. On top of all that, her father has promised her to the warrior Rodrigo. If he succeeds in overthrowing the evil James V, he gets Elena as his reward. Elena does not like this. Each of the singers performing these roles is the top in his field which made for some pretty spectacular singing, John Osborn in particular comes on like gangbusters. The hit tunes for this opera are "Tanti Affetti" and "Mura felice" sung by Malcom when he first enters. Juan Diego is still king. The highland clansmen prepare for war with the army of the king for a large part of the plot, then the clansmen lose, Rodrigo dies offstage, and we shift suddenly to the palace. People complained about this scene. Every scene in any production whatsoever is not going to be rich and elaborate. Throughout most of the opera we are in the highlands of Scotland, in the beautiful countryside. Then suddenly we are in a small space surrounded by black curtains with a red floor. To me this was obvious: now we are in the palace. Palaces have red floors, Scottish highlands don't. This is yet another instance of me not being confused by a stage set that everyone else is complaining about. This isn't a movie. Crosses burning is a more legitimate thing to complain about. Why do that? Additional research reveals that burning crosses were in the original poem The Lady of the Lake by Sir Walter Scott, 1810. Rossini's opera appeared only 9 years later. I liked very much the king reveal sequence in the last scene. Gradually he turns into the king until finally she notices it too. I had to remind my seatmates that at certain times in the history of opera only happy endings were allowed. Elena gets her Malcom. Joyce DiDonato finished the opera with best rendition of "Tanti affetti" I have heard. It had true passion as well as spectacular coloratura. There are a lot of versions of this on YT but none as truly beautiful as this. The main story here is love and not war. We skip rapidly through the battles so we can celebrate love whenever possible. This is as it should be. I enjoyed this opera very much, though it lies outside the mainstream. I saw this streamed on medici.tv before going to Salzburg in the Verdi year, 2013, and now I am finally viewing the DVD. This opera is very complex, and I think it benefits from multiple viewings. Watching it again I feel less puzzled by events than when I previously reviewed it. There was a period of about 50 years when no one performed Don Carlo at all, but now it is considered one of Verdi's greatest operas. I'm going to try to explain it. I love this scene and cannot imagine the opera without it. It establishes the relationship between Carlo and Elisabetta. They think they will be married, as they have been betrothed from a distance, and fall instantly in love. However, the scene begins with a chorus of complaining peasants. The plot has to do with Spain and Flanders, so complaining French peasants never come up again. Perhaps they are included to show how they love Elisabetta. Or they just wanted an excuse for a chorus at the start. 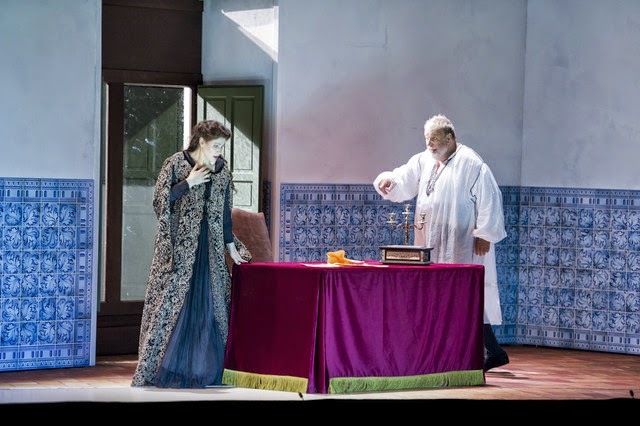 The scene ends with the announcement that Elisabetta will marry Philip II, king of Spain, and not Carlo, as part of a peace treaty between Spain and France. She takes it better than he does. Anja Harteros appears in an outfit that isn't black. A lot of fun was made of her outfit on social media, especially the hat. 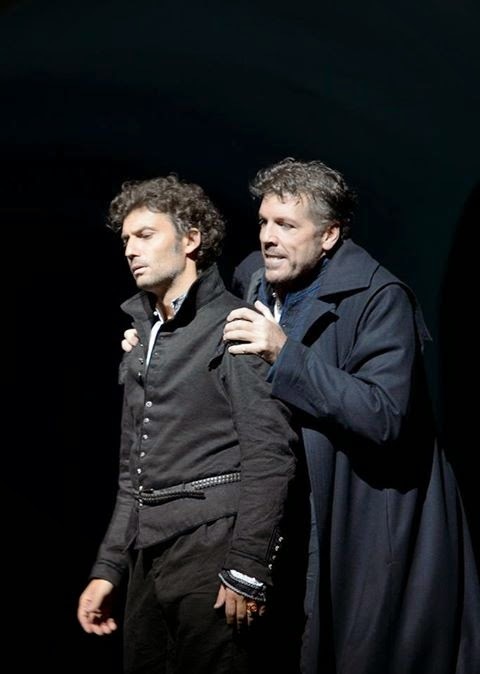 This scene also includes Carlo's only real aria which Jonas Kaufmann aces, of course. Sometimes the opera starts here. 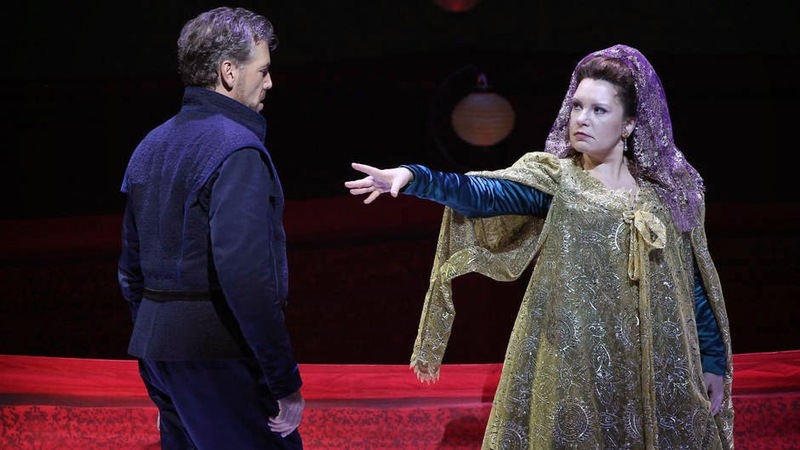 Don Carlo meets with his friend Posa, sung by Thomas Hampson. Carlo wants to talk about Elisabetta, and Posa wants to talk about conditions in Flanders where the Catholic Philip II is persecuting the Lutherans of Flanders. They sing the gorgeous friends duet. Elisabetta is with her ladies in waiting. 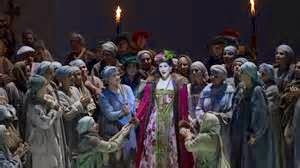 Eboli, sung by Ekaterina Semenchuk, is introduced with a song. 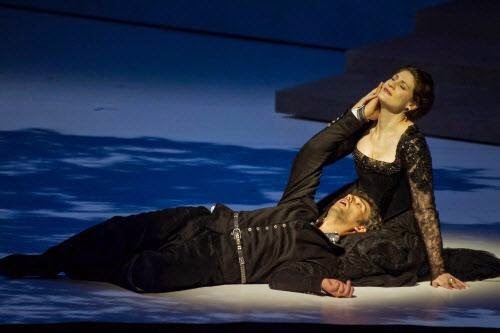 Posa and Eboli help to arrange for Carlo to be alone with Elisabetta, and a rather torrid love scene ensues. They are rolling around on the floor and Elisabetta says, "so you want to kill your father and marry your mother." This cools him off, and he leaves. The king enters and is furious because the queen has been left alone. He sends one of her women back to France. The king in this production is played by Matti Salminen who can project more nastiness on the stage than just about anyone. In real life Philip II is supposed to have been a nice guy. Real life is only marginally relevant in an opera. I liked very much the way this was staged. The celebration of the anniversary of the ascension of Philip II to the throne of Spain has begun. We hear celebratory music and see costumes and decorations that resemble carnival, including masks. The queen and Eboli appear, the queen complains that she is tired and wants to go pray, and asks Eboli to take her place at the celebration. She removes her outer garments, including a head piece, and Eboli puts them on. Elisabetta leaves. Eboli writes a note for Carlo, and he enters thinking Eboli is Elisabetta. This is much clearer if we have just seen them exchange clothing. Carlo is passionate until he realizes it is actually Eboli. Eboli is not happy with this, as she is in love with Carlo. 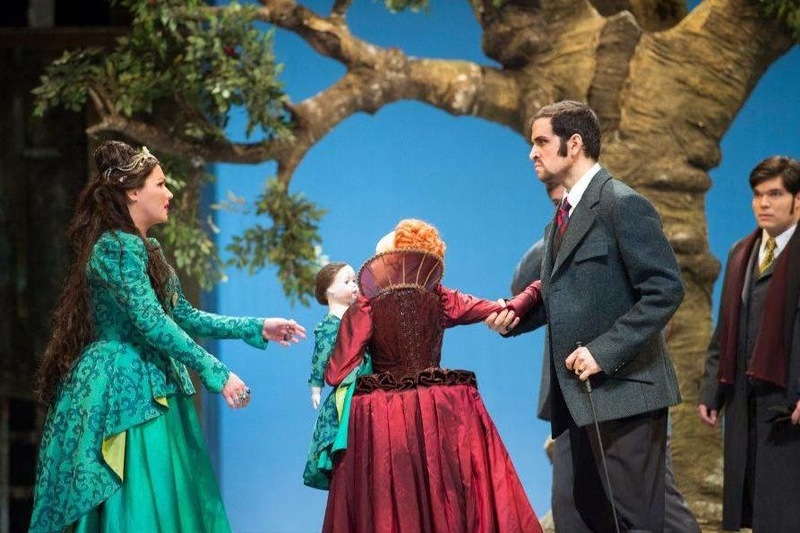 Posa enters, Eboli threatens to rat on Carlo, and Posa tries to stab her. Carlo prevents this, but Eboli is still angry. There is an extended trio with a lot of intensity. The titles can only tell what one person is saying. To know what all three are saying requires a libretto, which the DVD does not provide. This is called the "Auto-da-fé" or "act of faith" scene and features the burning of heretics condemned by the Inquisition. I have seen this scene several times and find it extremely confusing. The events go: heretics are dragged in; Flemish ambassadors appear and plead their case to the king with Posa and Carlo arguing on their side (shown above); the king refuses their plea and has them arrested and taken away; Carlo gets angry, pulls his sword and threatens the king; no one will confront Carlo until Posa steps forward and orders Carlo to give him his sword; Carlo obeys and the king immediately makes Posa a Duke and has Carlo arrested. Finally the king and queen take their places and the heretics are burned. Until just this minute I have thought that the burning of the heretics and the refusal of the Flemish ambassadors were somehow related. Now I see that this is not the case. Why include anything so completely grotesque as a human execution by burning? Isn't the plot the same without it? The burning is apparently part of the celebration which began in the previous scene. We want everyone to be happy and entertained so we burn a few people. Something like the Roman games. It also shows the king's obedience to the Inquisition. At least they've staged it in a subdued way with the heretics at the back of the stage. This is sensationalist BS. The confrontation between Carlo and Posa is also confusing. I guess Posa thinks that Carlo is out of control and should not kill the king. Confronting him is the only way to prevent it. The important point is that it isn't a betrayal of Carlo by Posa. He isn't plotting against Carlo. Posa is interested in Flanders and does not wish to harm either Carlo or the king. Carlo is still suspicious of him. The king is sitting alone in his study lamenting that his wife does not love him. He has been given her jewelry case with the miniature of Carlo that he gave her in the first scene. So if there is no first scene, what the hell is this? I am used to Ferruccio Furlanetto doing this scene. Matti is very intense. Just to keep things confusing there is also a scene with the Grand Inquisitor who reminds the king that he, the inquisitor, has more power and must be obeyed. He burns people at the stake so everyone is afraid of him. He demands that Posa be killed because he wants the Lutherans in Flanders to be persecuted. The king regards him as his friend and refuses. Elisabetta enters and the king confronts her about the portrait. She faints. This is the female version of when in doubt punt. If things aren't going well, faint. Eboli and Posa are also in this scene. When Elisabetta wakens, Eboli admits that it was she who gave the jewelry box to the king. 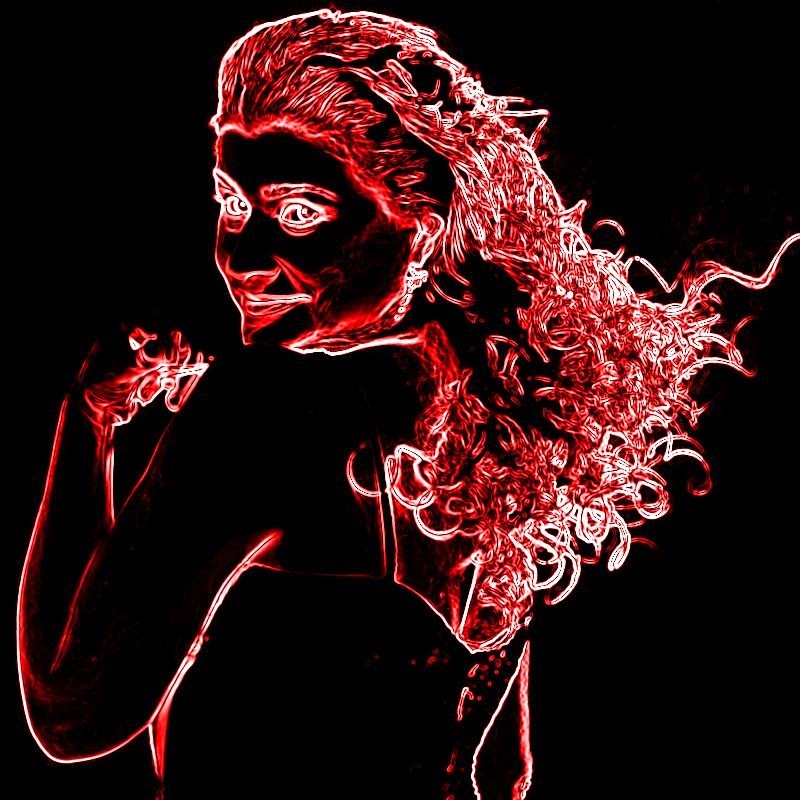 Everyone else leaves, and Eboli sings her big aria "O don fatale." She vows to try to save Carlo. The music of this scene is particularly beautiful. It deals with both politics and true emotions. Posa visits Carlo in jail where a shadowy figure kills him. I don't seem to have ever known what was going on here except that Posa dies. The question is who killed Posa? We see two men, both in dark robes, one with a soldier's helmet and one with a hood. The one in the helmet shoots Posa. Did the king give in to the Grand Inquisitor or did the Grand Inquisitor take care of matters on his own? Hampson struggles with the heavier parts of this scene but excels at the sweeter parts. He dies in close-up, very nicely. Carlo cries. Philip comes in bragging that he has killed him. Carlo curses him. Such emotion. Kaufmann is magnificent in his anger; his intensity is the secret of his fame. A crowd forms wanting to overthrow the king for killing Posa, but the Grand Inquisitor intervenes. There is no hint about how Carlo escapes in this staging. At the end of the scene he is still in the prison. We were here in scene 2. There's a huge duet between Elisabetta and Carlo. Musically this is the best part of the opera, and these two do it proud. There is nothing in this staging that hints at Eboli having a role in rescuing Carlo. When the queen and Carlo meet, he is leaving Spain. He is rescued by the ghost of his grandfather and disappears, we assume for Flanders. It is a customary operatic deus ex machina. King Charles is made up to look like a bronze statue. This opera is a patchwork, a many times reworked patchwork. We put in some stuff. We take some of it out. We put in some more. Etc. We love the music, so we don't mind so much that the story is so disorganized. In contrast La Forza del Destino is much easier to follow but is implausible. I love this opera very much, and it is all here with this cast. Together they are magic. This is simply wonderful. 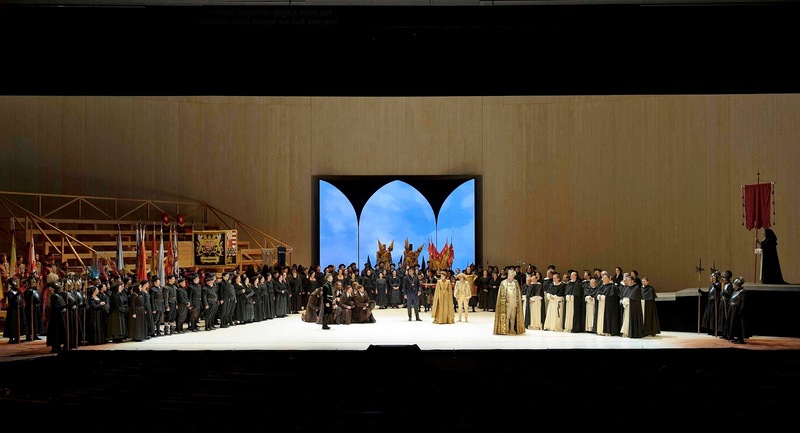 Have I ever seen a Verdi Don Carlo that was so wonderful as this? Addio per sempre. After the complete opera recording of Aida with Pappano, Kaufmann and Harteros which took place last week (studio recordings are not dead after all), there was a concert performance at the Academia Nazionale di Santa Cecilia. The recording is due in October. If I read correctly, Cecilia attended. You may listen on Parterre, but you cannot jump ahead, so be ready to sit for a while. Barbara Baker I have so far made it through the Celeste Aida and find it the first time it has actually sounded like a love song and not like some loud tenor showing off. Celeste legato.